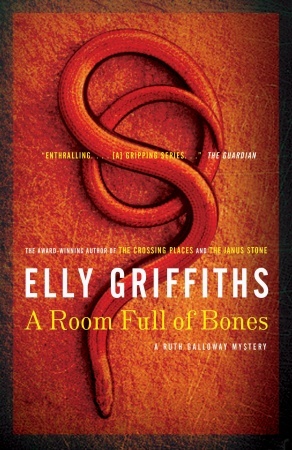 I’m always up for discovering a new mystery series, so when I heard of Elly Griffiths’ A Room Full of Bones, which features Ruth Galloway, a forensic archaeologist who solves mysteries, I was definitely interested. In Bones, a museum curator is found dead beside a coffin thought to contain the bones of medieval Bishop Augustine. I work in an art gallery, and I’ve always been fascinated by museums and artifacts, so I was excited to see how a forensic archaeologist would use her expertise to solve this mystery. Unfortunately, I didn’t really see much mystery-solving from Ruth Galloway in this book. Bones is the first Galloway I’ve read but the fourth book in the series, and from this Eurocrime review, I see that Galloway is usually more involved in the actual case. However, I agree with the Eurocrime reviewer that the Galloway storyline in this book focused way too much on her personal life. It’s certainly realistic — as a single mother of a one year old, I can imagine that’ll take up most of her time. As well, I bet long-time fans of the series would be pleased to see so much character development. We learn not just about Galloway as a mother, but also about her complicated relationship with the baby’s father, D.I. Harry Nelson. To be honest, I really felt for Nelson’s wife Michele, and I did enjoy the scenes where she and Nelson struggle to make their relationship work. I also liked that, while Galloway clearly loves Nelson as the father of her baby, she doesn’t seem to be in love with him. I found that an interesting twist to the usual love triangle. Despite the focus on Galloway’s personal life, there is a pretty interesting mystery in Bones. Galloway does discover a shocking fact about the bishop from the bones, and her expertise is eventually key to solving the curator’s death. I was disappointed that these pivotal elements appeared mostly in passing and I was somewhat disappointed at the way that mystery was resolved. That being said, there are a couple of other mysteries in Bones — another character’s death and Nelson himself contracting a mysterious disease. These are both interesting puzzles, and I love the cast of secondary characters that we get to meet. The Smith family members are particularly quirky, and I like how the they reminded me a bit of Agatha Christie’s mysteries. We have all these complex characters, each potentially with his or her own motivations to commit a crime. A blurb at the back of the novel calls Griffiths’ books “atmospheric,” and definitely, Bones contains an element of the gothic. I like that Griffiths never really confirms whether an incident is supernatural or whether it can be explained by science. For one plot twist in particular, Galloway’s friend Cathbad, a Druid, offers a supernatural explanation and drug-induced hallucinogenic solution, yet later on, someone else gives a more prosaic, perfectly rational explanation. This ambiguity adds to the atmosphere. While I found the potentially supernatural elements odd, I never really was sucked deep enough into the story to find them genuinely creepy. Even when someone received a snake that Cathbad says was a curse, I really just thought of it as a snake, despite Griffiths’ ambiguous treatment. That being said, I did have a horrible nightmare the first night I read this book. Perhaps my subconscious was more afraid than I realized. A Room Full of Bones is a pretty good mystery. I was expecting a bit more of the historical mystery and I would have liked to see a bit more of the forensic archaeologist side of Ruth Galloway, but her personal life does make for an interesting story. I liked learning about the relationships between the characters, and I like how Griffiths made them seem real. This entry was posted in Book Reviews and tagged 50BookPledge2012, Fiction, Horror, McClelland and Stewart, Mystery, Random House by Jaclyn. Bookmark the permalink. Alas, it wasn’t my fave of the series either. The first three books are better, more focussed on the science and not her personally.